I like to re-post this at the beginning of each year! This may help some of you that follows this to save a few bucks by the end of the year! As we recover from the holidays, and more importantly holiday spending, I have a proposal for you that you won’t be able to resist. How would you like to save over $1,300.00 this year by saving one dollar the first week? Sounds like it’s too good to be true, well actually it isn’t. Begin the 52 week money challenge today. 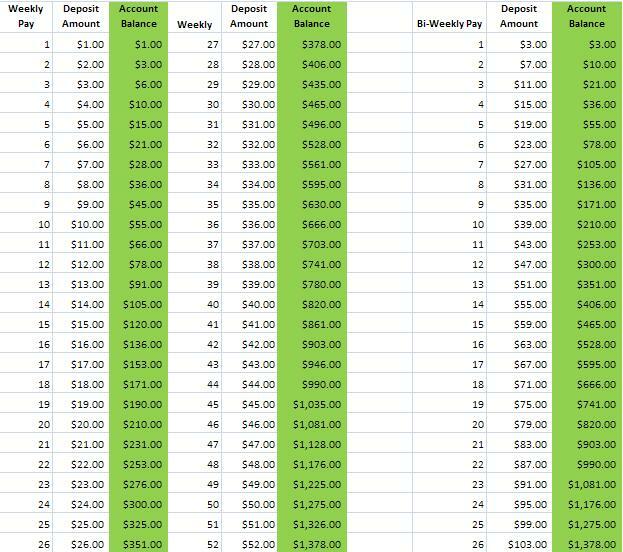 If you get paid bi-weekly, then follow the 26 week plan. Be sure to revisit this page and post your comments about this plan and let me how your savings are accumulating.